We have data from customer abReviews and publications indicating that this antibody is capable of detecting CD36 via western blot. However, based on customer feedback of difficulties and extensive troubleshooting using this antibody in western blot, we are removing WB as a tested application and recommend ab133625 as an alternative for use in this application. Our Abpromise guarantee covers the use of ab17044 in the following tested applications. Blocking Use at an assay dependent concentration. Blocks collagen/thrombospondin binding. Is unsuitable for IHC-P or WB. Detection of CD36 in THP-1 cells. Red, black and blue line represent the isotype control, cells only and ab17044 at 10 μg/ml, respectively. Overlay histogram showing THP1 cells stained with ab17044 (red line). The cells were fixed with 4% paraformaldehyde (10 min) and incubated in 1x PBS / 10% normal goat serum / 0.3M glycine to block non-specific protein-protein interactions. 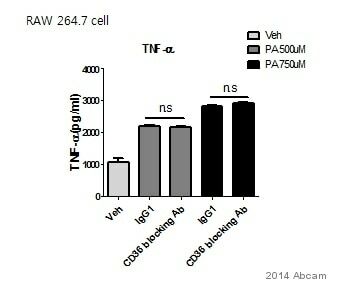 The cells were then incubated with the antibody (ab17044, 1µg/1x106 cells) for 30 min at 22ºC. The secondary antibody used was DyLight® 488 goat anti-mouse IgG (H+L) (ab96879) at 1/500 dilution for 30 min at 22ºC. Isotype control antibody (black line) was mouse IgG1 [ICIGG1] (ab91353, 2µg/1x106 cells) used under the same conditions. Acquisition of >5,000 events was performed. This antibody gave a positive result in 80% methanol (5 min) fixed THP1 cells used under the same conditions. Publishing research using ab17044? Please let us know so that we can cite the reference in this datasheet.